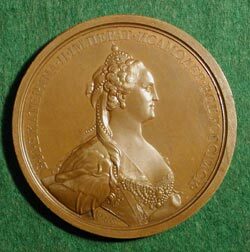 Obv: Bust of Catherine II (r); Legend in Cyrillic translated as: "By the Grace of God Catherine II Empress of all Russia". Rev: Under a palm tree the Goddess of harvest Ceres is sitting on sheaves of grain. In her right hand is the caduceus of Mercury and in her left is a wreath. A farmer with a plow is in the background. Legend in Cyrillic translated as: "To Everyone Is Given According to Their Labor". 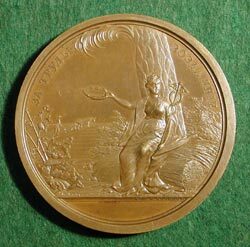 This is an Award Medal of the Free Economic Society.